With the June 2010 release of the LaunchPad, Texas Instruments ushered in a new era in hobby level microcontroller programming. Priced at $4.30, TI has effectively eliminated the cost of entry to its MSP430 processors. For the price you get a USB programming board, two micros, a clock crystal, access to software downloads, male and female headers, and they even toss in a USB cable. If the initial public response is any indicator of future success, then we can expect LaunchPad to be a player in the hobby market. Day one ordering was intense and the TI online store was immediately overwhelmed by the volume. This Hobbizine "first look" is coming out in late August because TI, Digikey and Mouser all went instantly to backorder and it took two months for our own day one order to arrive. 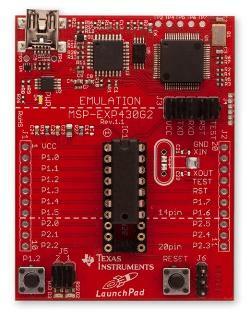 LaunchPad is the starter kit for TI's recently announced MSP430 Value Line series of low cost processors. The company has been touting the Value Line as having prices "as low as" $0.25, but that's for quantities of 100,000 or more. In single quantities expect to pay about $1.75-$2.25. The board features a 20-pin DIP socket, two LEDs - one green and one red - and two push buttons. All of the microcontroller pins breakout to standard spaced holes on the board to be interfaced with external components. The USB interface supports onboard programming of all MSP430G2xx and MSP430F20xx Value Line devices in 14 or 20 pin packages via the socket. Additionally the LaunchPad can program the eZ430-RF2500T target boards, the eZ430-Chronos watch module or the eZ430-F2012T/F2013T target boards. It also provides a 9600-Baud UART serial connection to a host PC. As the LaunchPad programming and debugging capabilities are built around the Spy Bi-Wire (2-wire JTAG) interface, there are a number of compatible software options, including the MSPGCC open source GNU toolset. TI has made available free "code limited" versions IAR Embedded Workbench (4K limit) and Code Composer Studio (16K limit). Although LaunchPad and Value Line are new, the first MSP430 appeared in 1993 and its use is well established in industry and education. The series is built around a 16-bit RISC CPU. Different members of the Value Line branch of the family will of course offer different capabilities, but the line offers features such as a 16-bit timer, 10-bit analog channels, brown out detection, and support for SPI or I2C. The series is perhaps most notable for its extremely low power consumption and low supply voltage. My first hands-on experience with LaunchPad was very good. I chose to install the Code Composer Studio from the TI website. Normally I would have avoided the Code Composer option because of the code size limit, but a lot of the available demo code uses it and I wanted the experience. It was a large download (several hundred megabytes) and I had to register at TI, but I didn't have any problems. The software installed without issue and the system recognized the LaunchPad also without issue - no annoying hunting around for drivers, DLLs etc. I found a tutorial at TI's Wiki page for LaunchPad, and got a little LED flasher program compiled and downloaded in fairly short order. Great success! While I didn't come across any problems with the board itself, there are a couple of points worth making that are perhaps more clarifications than criticisms. LaunchPad is being variously presented and perceived as a beginner platform ready to go toe-to-toe with Arduino. In truth it's neither of those things. LaunchPad is not as much an SBC or development board as it is a programmer with a target board. In their current state the documentation and tutorials are too thin and lacking focus. Also, IAR and Code Studio are both pretty high level toolchains; it's quality stuff but not necessarily the easiest place to start. Looking around at TI's competition in the hobby market, LaunchPad has a lot of catching up to do. There are mountains of available code, schematics, tutorials, advice and discussions for products such as Arduino, PICAXE and Propeller, as well as raw PICs and AVRs. Nonetheless, its hard to imagine LaunchPad not grabbing its share. In addition to price, TI is making a concerted effort to reach out to hobbyists. They've open-sourced the hardware, linked to personal blogs from their Wiki, and posted videos to YouTube. This level of outreach is unprecedented from a major semiconductor manufacturer. The other hobby platforms are driven by third parties. TI has significant resources to put behind LaunchPad and if they stick with it could easily see the project through any bumps in the road. In short, LaunchPad is a good little board that TI is basically giving away. It may not be all things to all people, but it will get you up and running with the MSP430 microcontroller. Go ahead and give it a try. Teach yourself the fundamentals of digital logic with the Deluxe Digital Logic Lab. The kit provides a generous assortment integrated circuits, transistors and other needed components. It is fully supported online at the Sully Station Technologies website with breadboard layouts, schematic diagrams, technical notes and datasheets. Build transistor logic gates, flip-flop memories, adders, counters, decoders, multiplexers and more.